I recently attended a the Berkshire Geobash #3 Mega-Event in Massachusetts and came across one of the most devious hides I’ve ever seen. So devious, it inspired me to write a whole blog post dedicated to creating geocaches that some may consider “evil”. Not evil in the possessed by spirits evil, but evil in that when searching, frustration is inevitable. If you’re ever in western Massachusetts, near Pittsfield, finding My Wife Thinks I’m Nuts (GC1MW7), created by Gary, is an absolute must. 나는 최근에 메사츄세스에서 열린 Berkshire Geobash #3 메가 이벤트에 참가하였습니다. 그리고 내가 여태까지 본 것 중 최고로 지오캐셔를 기만하는 캐시에 속할 만한 지오캐시에 강한 인상을 받았습니다. 그 기만의 인상이 나로 하여금 모든 블로그 글들을 소위 "악마 캐시"라고 불리는 지오캐시를 만드는 것에 관하여 쓰도록 만들었습니다 실제 악마가 아닌 정신적인 데미지를 주는 악마의 특성을 지닌 것으로 이러한 악마는 지오캐시를 찾을때 마다 나타나서는 지오캐셔로 하여금 좌절감에 빠져들게 합니다. 만약 당신이 메사츄세스 서부에 있다면 피츠필드 근처에 Gary가 설치한 My Wife Thinks I’m Nuts (GC1GMW7)캐시는 반드시 찾아 봐야 할 것입니다. Don’t get me wrong—I love camo duct tape. It’s an easy way to add a little bit of cloaking to your geocache. However, when it comes to being truly devious, the right camouflage can make or break your hide. 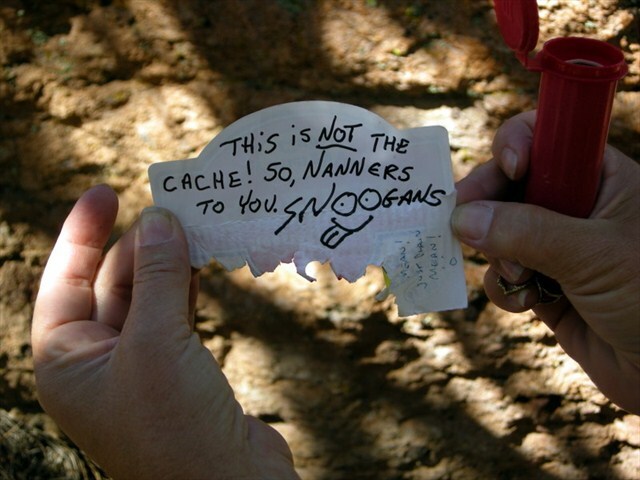 The real challenge is to make your geocache look like everything that’s around it—like it belongs there. Think fake logs, fake rocks, fake gum (ew) or even the always maligned fake dog poo. 오해하지 마세요 - 나도 위장 테이프를 자주 애용합니다. 그것은 당신의 지오캐시에 약간의 은폐를 더할수 있는 쉬운 방법입니다. 그러나, 정말로 지오캐셔를 기만해야 하는 상황이 왔을 때, 위장테이프로 만든 위장은 당신의 은폐를 도울 수 도, 그렇지 않을 수 도 있습니다. 진짜 도전은 당신의 지오캐시가 지오캐시를 숨기는 장소 주변에 원래 있었던 것 처럼 똑같이 만드는 것입니다. 가짜 통나무, 가짜 돌, 가짜 껌(씹은) 또는 항상 피해가게 되는 가짜 개응가도 고려해 볼 만 합니다. You read that right. Hide in plain sight. This might mean skipping the traditional geocache container for something a little more creative. Just think: if your geocache looks like it’s just part of the surrounding decor, geocachers may not be apt to look there. This step is crucial for clever urban hides. 당신은 올바로 읽은 것 입니다. 대놓고 보이게 숨기기 맞습니다. 이것은 좀 더 창조적인 것을 위해 전통적인 지오캐시 컨테이너의 형식을 건너뛰는 것을 뜻할지도 모릅니다. 생각해보세요 : 만약 당신의 지오캐시가 주변의 장식의 일부처럼 보이게 만든다면 지오캐셔들은 아마도 섣불리 그것을 때어내지 못할지도 모릅니다. 이 단계는 재치있는 도심지 지오캐시를 만드는데 있어 중요한 요소입니다. 지오캐시가 있는 장소까지 걸어 가거나, 찾아 보는것은 간단해서 쉽게 지오캐시를 발견 할 수 있습니다. 그러나 그 후에 이 지오캐시는 자연스럽게 변화를 원합니다. - 더 어려워지게끔. 당신이 이 지오캐시를 찾기 위해서 단어 퍼즐 문제를 풀 필요는 없습니다. 대신 회전판을 돌려야 합니다. 텔레비젼 쇼 프로인 "Wheel of Fortune"을 기초로 한 이 회전 장치의 바깥쪽 끝에는 많은 컨테이너가 있고 단 하나에만 로그북이 있습니다. 올라가서 회전판을 돌리고 결과를 보세요. 만약 당신에게 행운이 있다면 첫번째 시도에서 지오캐시를 찾을 수 있을 것 입니다. Finding a geocache can be as simple as walking to a location and looking down. But after a while, it’s natural to want to change it up—even make it more difficult. 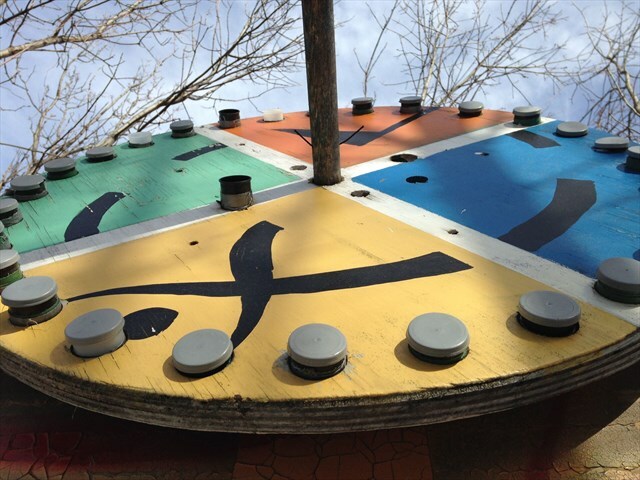 With this geocache, you won’t have to solve a word puzzle to make the find, but you will have to spin the wheel. Around the edges of this spinning contraption, loosely based on the television game show "Wheel of Fortune", are many containers—only one of which holds the logbook. Make the hike, give the wheel a spin and see if you’re lucky enough to find it on the first spin! "나는 온타리오주 벌링턴에서 길가에 버려진 나무로 만들어진 커다란 '케이블 스풀'을 발견했습니다. 나는 그것을 집으로 가져와 2개의 커다란 원형 회전판을 분리했습니다. 나는 지오캐싱 심볼색과 같은 색을 가진 조그만 캔들을 찾아내고 지오캐싱 심볼을 그린 다음 색칠을 하였습니다. 나는 드릴로 25개의 구멍을 뚫은 뒤 그곳에 필름 컨테이너들을 삽입하였습니다. 단 하나의 컨테이너에 로그시트가 들어 있으며 그것은 '당첨'된 지오캐셔만이 찾을 수 있습니다. 얼마후 나는 회전판이 돌지 않는다는 몇몇 코멘트를 받았습니다." "I found a large discarded wooden cable spool on the side of the road in Burlington Ontario. I brought it home and separated the 2 large round spools. I searched for small cans of paint the same colors as the Geocache symbols, drew out the Geocache symbol and painted it…I drilled about 25 holes and added film containers in the holes. One container contained the log sheets…It was a "hit" with geocachers. I had some comments that the wheel did not spin." "2010년에 나는 나머지 회전판에 색칠을 하고 필름 컨테이너를 삽입 할 수 있게 구멍을 만든 뒤 회전을 할수 있도록 가운데에 구멍을 뚫었습니다. 나는 5번 고속도로의 안쓰는 도로표지판에 사다리를 타고 올라가 그 꼭대기에 회전판이 빙글빙글 돌아가도록 설치 했습니다. 이 캐시는 가끔 필름 컨테이너가 말라 갈라지거나, 뚫어 놓은 구멍에서 빠지는 등 지속적인 관리가 필요합니다." "In 2010 I painted the other spool and drilled holes for film containers and a hole in the center so it could spin. I had a location on Hyway 5 that had abanded sign post. With the help of a ladder I managed to install the spool high on the sign post and make it SPIN. The caches require maintenance from time to time as the film container dry out and crack or fall out of their pre drilled holes." A milestone 14-years in the making reached yesterday at 7:45 am as the millionth geocache was published in the U.S.
어제 오전 7시45분에 미국에서 백만번째 지오캐시가 등록됨으로써 14년만에 새이정표에 도달했습니다. 1,000,000 reasons for Americans to get off the couch and explore their neighborhoods are waiting to be discovered and some are likely within walking distance. Geocaching.com launched in 2000, listing just 75 hidden geocaches. As of 7:45 am EST on Sunday, September 14, the 1,000,000th active geocache in the U.S. was published on Geocaching.com. The 1,000,000th active geocache is called Daddy’s Fishing Hole, located near Chambersburg, Pennsylvania. 미국인들을 소파에서 내려오게 하고 그들 주위를 탐색하게 할 백만가지 이유들이 당신에 의해 발견되기를 기다리고 있으며, 그중 몇몇은 당신이 걸어서 갈 수 있는 거리에 있습니다. 2000년에 시작된 지오캐싱닷컴은 단지 75개의 지오캐시만을 가지고 있었습니다. 9월14일 일요일 오전 7시45분(EST)에 미국에서 백만번째 액티브 지오캐시가 지오캐싱닷컴에 등록되었습니다. 백만번째 지오캐시의 이름은 Daddy's Fishing Hole이며 펜실베니아주 체임버즈버그 근처에 있습니다. As of 9:00 am PCT on Monday, September 15, the 1,000,000th geocache has only been found only three times. To celebrate the 1,000,000th active geocache in the United States, the staff at Geocaching.com named the top 8 most amazing geocaches for beginners in the U.S.
9월15일 월요일 오전 9시(PCT)까지 이 백만번째 지오캐시를 단 3명만이 발견했습니다. 미국에서의 백만번째 엑티브 지오캐시를 축하하기 위해 지오캐싱닷컴의 스텝들은 미국에서 초보자들을 위한 최고로 놀라운 8개의 지오캐시들을 지정했습니다. The 8 Most Amazing Geocaches for Beginners in the U.S.
Just outside Milwaukee, WI, adventure-seekers will have a little extra help from some geocaching chickens. 위스콘신주 밀워키 외곽에서 지오캐셔들은 닭캐셔(? )들로 부터 도움을 좀 받아야 할 것입니다. Geocachers in Hershey, PA will be able to channel their inner Indiana Jones with this adventure. 펜실베니아주 허쉬의 지오캐셔들은 이 모험을 통해 그들 마음속의 인디아나 존스가 잠들어 있다는것을 알게 될 것입니다. Visitors to Fremont, CA, will learn the best way to catch a geocacher (and it might just involve a giant mouse trap). Follow the yellow brick road to this geocache in Saratoga, Springs, NY. 뉴욕주 사라토가스프링스에서는 이 지오캐시를 찾기 위해서는 노란 벽돌 길을 따라가세요. Unlock a 1890’s history lesson involving Moon Towers in Austin, TX. 택사스주 어스틴에서는 문타워에 관련된 1980년대의 역사 문제를 풀어보세요. Visitors to Blackshear, GA can discover a newspaper box that’s out of the ordinary. 조지아주 블백시어의 방문자들은 평범하지 않은 신문 자판기를 발견할 수 있습니다. 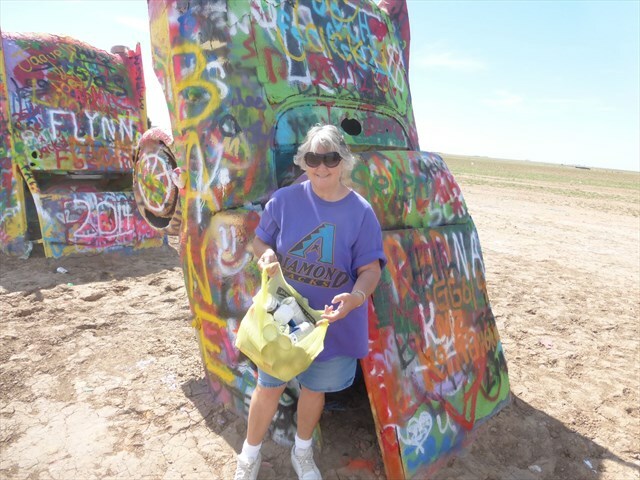 Stop by Denver, CO to find a geocache that’s a puzzle and a fashion statement. 퍼즐과 독특한 분장을 가진 지오캐시를 발견하기 위해 콜로라도주 덴버를 방문하세요. One AA battery is all new geocachers in Seattle, WA need to unlock this geocache. 워싱턴주 시애틀에서는 이 지오캐시를 풀기 위해 모든 지오캐셔들이 AA건전지를 가지고 있습니다. Geocaching events will be held near each of the sites the weekend of the September 20 to cheer on the 1,000,000th geocache and welcome new geocachers to the adventure. Expert geocachers will attend each of the geocaching events to guide new people through the free adventure. They’ll also give insider tips and tricks, and help find the geocache. New geocachers should register for the events and anyone can find a geocache near them now. 9월20일 주말에 백만번째 지오캐시 탄생을 축하하며, 이 새로운 모험에 뛰어든 신규 지오캐셔들을 환영하기 위해 각각의 지오캐시 주변 지역에서는 지오캐싱 이벤트가 열릴 것입니다. 경험 많은 지오캐셔들은 새로운 모험을 통해 지오캐셔 희망자들을 각지의 이벤트로 안내해 줄 것입니다. 또한 그들은 지오캐싱의 팁과 요령을 알려줄것이고, 함께 지오캐시를 찾는것을 도와줄것입니다. 신규 지오캐셔들은 이벤트에 등록을 해야 합니다. 그리고 누구라도 그들 주변에 있는 지오캐시들을 당장이라도 찾을 수 있습니다. 지오캐시들은 미국 모든 50개주에서 찾을 수 있습니다. California holds the record for the state with the most active geocaches, boasting more than 130,000 hidden geocaches. 캘리포니아는 모든 주중 최고로 많은 130,000개이상의 액티브 지오캐시를 가지고 있는 주라는 기록을 가지고 있습니다. The oldest active geocache in the U.S.. published in May of 2000, is located in Mingo, Kansas. 2000년 3월에 등록된 미국에서 가장 오래된 액티브 지오캐시는 캔사스주 밍고에 있습니다. Texas A&M just published an independent, CDC-funded study on the health benefits of geocaching. 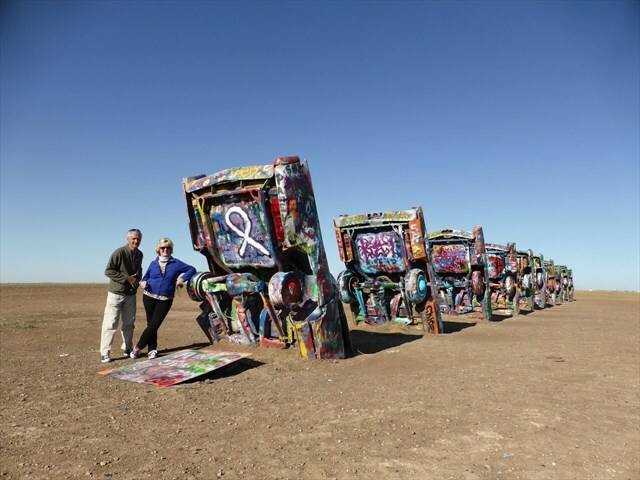 Texas A&M은 지오캐싱과 건강과의 관계에 관련된 독자적인 CDC투자 연구를 발표하였습니다. 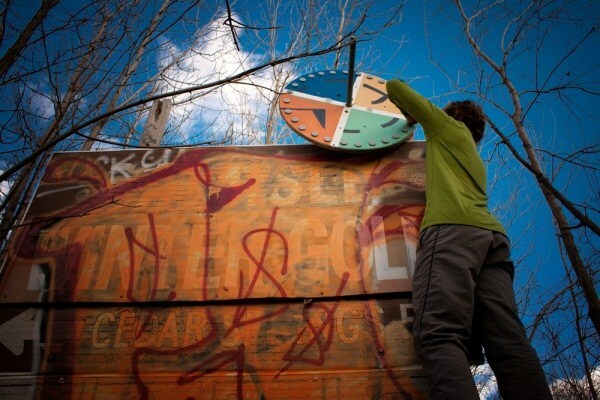 Geocachers occasionally arrange their geocache hides in the form of county-sized art. 지오캐셔들은 때때로 지상화의 크기의 형태로 지오캐시들을 배열합니다. Nearly 11 million people have registered for accounts on Geocaching.com since 2000. 2000년 이후 거의 십일만명의 사람들이 지오캐싱닷컴에 회원으로 등록 되어 있습니다. Germany is second to the U.S. in active geocaches with 325,000. 독일은 미국 다음으로 많은 325,000개의 액티브 지오캐시가 있습니다. There are currently 2,487,221 active geocaches hidden around the world – in 2013 alone geocachers were found 75,453,001 times. 현재 전세계적으로 2,487,221개의 액티브 지오캐시가 숨겨져 있습니다. 2013년 한해 지오캐셔들은 총75,453,001건의 지오캐시들을 발견하였습니다. 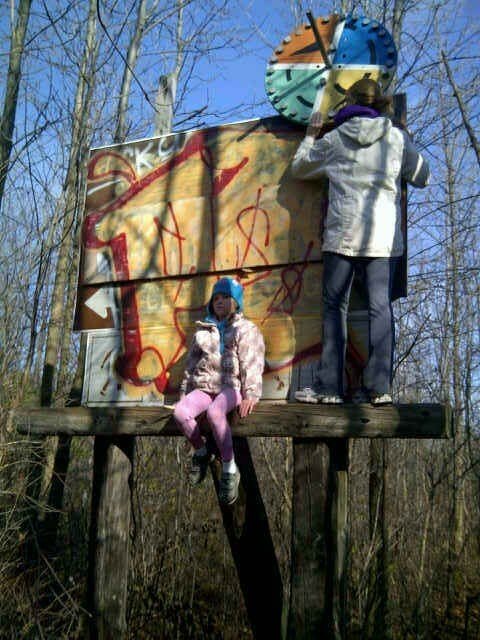 When you set out on a geocaching adventure, you never know what you’re going to find. 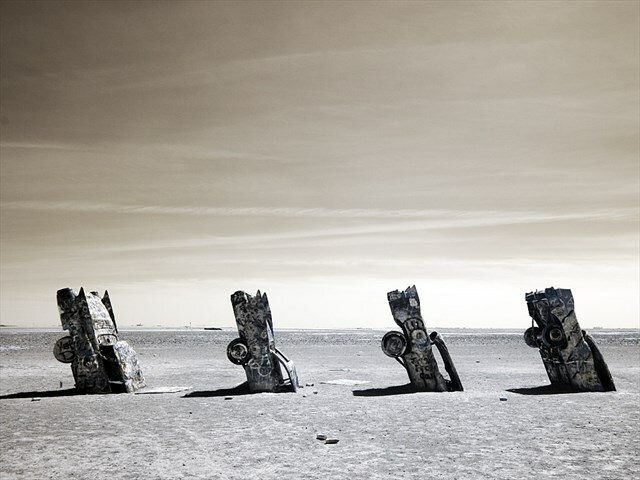 Of course we always hope it’s the geocache, but you could end up finding a place you never knew existed, another geocacher, a wild animal, or even—in this case—a few Cadillacs sticking up out of the ground. 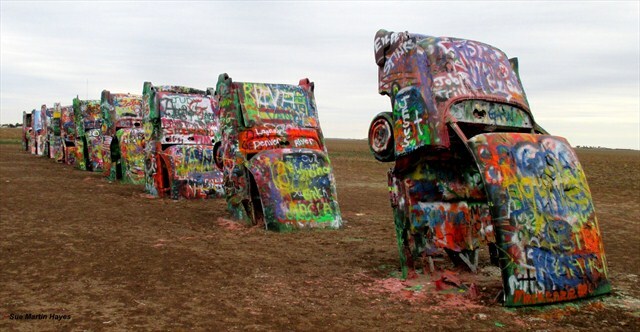 This art installation near Amarillo, Texas was created in 1974 and has been a must-see stop along Route 66 ever since. 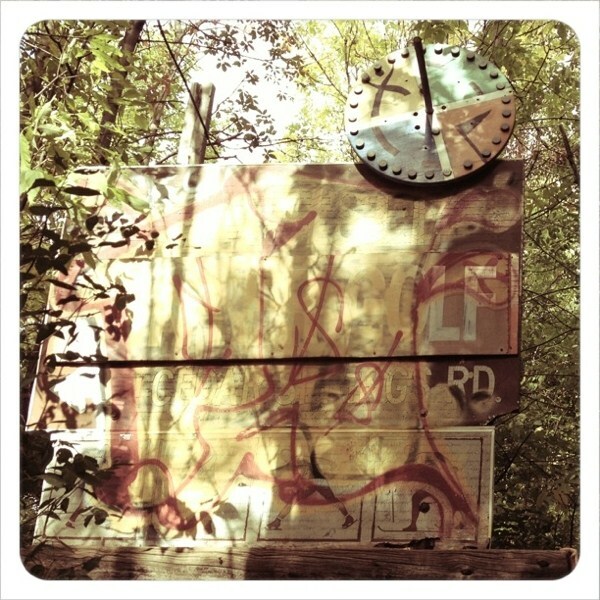 If you’re ever in the area, finding this geocache is a must. One thing to keep in mind: this piece of art is in danger of being removed due to visitors leaving their empty spray-paint cans behind. Do your part as a geocacher and CITO around the area. We all appreciate it! 당신이 지오캐싱 모험을 위해 출발할 때는 당신이 무엇을 발견하게 될지 모릅니다. 물론 저희들은 그것이 지오캐시이기를 늘 희망하지만, 결국엔 당신이 가보지 못한 장소를 발견 할 수도 있고, 다른 지오캐셔나 야생동물을 만날 수도 있지만 (이번 글에 한해서는) 야외에 땅에 꽂혀 있는 몇 대의 캐딜락 자동차들을 만날 수도 있습니다. 텍사스주 아말리오 근처에 있는 이 설치예술 작품은 1974년에 설치되었으며, 그 이후로 (역사적인)66번 국도의 관광명소가 되어왔습니다. 만약 당신이 이 지역을 방문한다면 이 지오캐시를 반드시 방문해 보세요. 한 가지 주의사항은 현재 이 미술작품은 방문객들이 떠나면서 남기고 간 칼라 스프레이 깡통들로 인해 철거될 위기에 처해 있습니다. 만약 당신이 지오캐셔라면 이 지역을 CITO 해주세요. 그래주신다면 정말 감사하겠습니다. "저는 더블 디스크 골프 대회에 참가하기 위해 텍사스주 덴턴에서 뉴멕시코주에 있는 시파푸를 자주 오가면서부터 이 지오캐시를 설치하고 싶은 생각이 들었습니다. 우리는 2002년에 이 장소를 처음 방문한 이래 거의 매년 이곳을 방문하고 있습니다. 처음 우리가 뉴멕시코를 향해 차를 몰고 가던 중에 농지에서 무언가 이상한 것을 발견하였습니다. 우리는 I-40도로를 운전하면서 꽤 지루함을 느꼈기 때문에 곧바로 유턴을 했고 멋진 사진을 위한 장소를 발견했습니다. 우리는 차를 세우고 그 작품을 마음껏 즐겼습니다. 저는 누가 이 장소에 이것을 놓았을까 그리고 왜 그래피티로 칠해져 있는지 궁금했습니다. 아무 것도 알 수 없었지만 그건 정말 멋진 장소 였습니다." 미국 국도 제66호선(영어: US Route 66)은 일리노이 주 시카고 에서 캘리포니아 주 로스앤젤레스 군 산타모니카 까지 잇는 길이 3.945km의 국도이다. 1926년 11월26일 에 완공하여 1985년6월27일까지 미국 고속도로에 지정되었다(1985년6월27일에 고속도로 해제 (폐쇄)) 당시 미국 최초의 대륙횡단(동-서) 고속도로 중 하나였으며 미국 경제불황기에 미국국민들이 서부로 이주하면서 중간중간에 작은 상점들이 생겨나기 시작했으며 많은 영화 와 뮤직비디오의 무대가 되기도 하였다.1985년 미국지도에서 삭제되었으나 2003년 루트 66복원이 마무리 되었다 현재는 주로 관광객들이 이용하거나 옛추억을 떠올리는 미국인들이 가장 많이 찾는 미국 국도로 이용되고있다. ※참고: 루트66의 별명은 엄마의 도로 또는 엄마의 길 이다.